How Often Should I Change Hand Towels? In our house, we use hand towels in the bathroom, kitchen and guest bathroom. 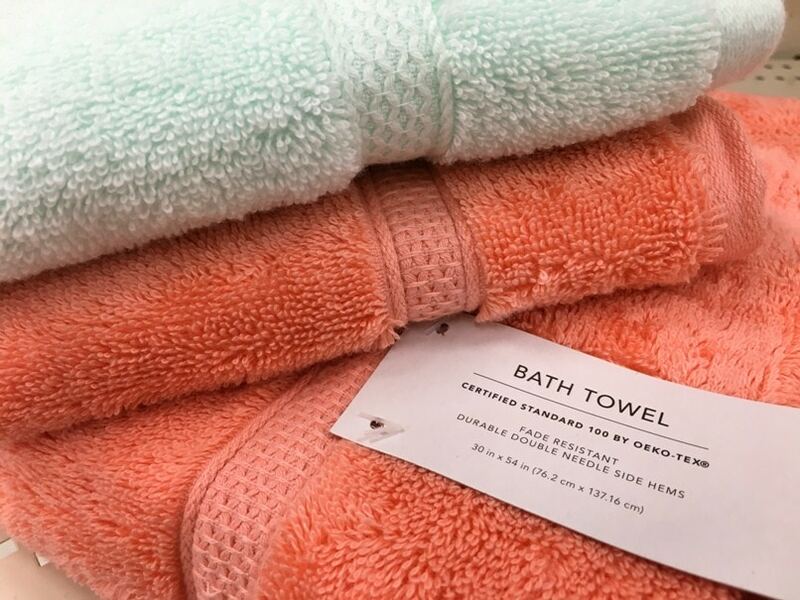 Cloth hand towels are so much nicer and luxurious than paper hand towels. (They are also more sustainable and less expensive, too.) 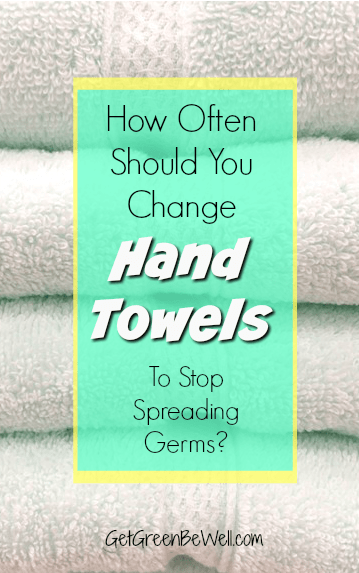 When cold and flu season starts, though, I always find myself wondering how often should I change hand towels? As a WELL AP, one of the areas we look at for WELL Certification of commercial spaces is the availability of hand towels. In a public setting, those hand towels would be paper-based, but that is because of the communal nature of so many people. 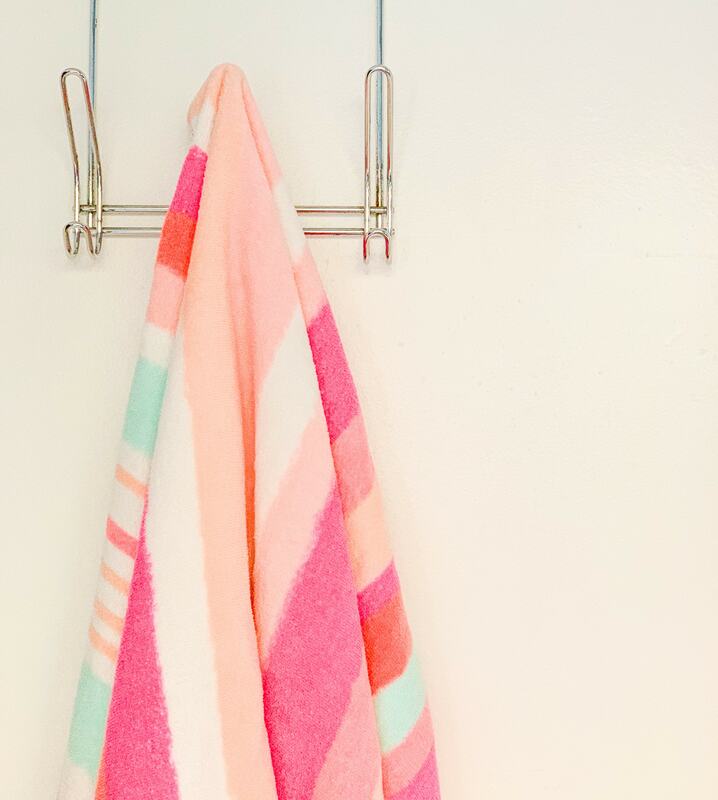 For the WELL Standard, supplying towels is mandatory in bathrooms (along with fragrance-free hand soap) because the friction of drying your hands is more effective at removing bacteria than air drying. So using hand towels to dry your hands not only helps remove bacteria, but also saves money when you reuse cloth hand towels rather than buying disposables in a family home. How Often Should I Change My Hand Towels? Dr. Charles Gerba, a microbiologist at University of Arizona, stated in Time Magazine that every two days is usually sufficient to replace hand towels. Here’s the key. Where is the hand towel located, and can it dry out? (See the helpful tip below.) Is your hand towel located in a tiny bathroom under the stairs with no natural light and no ventilation? Or is your hand towel in a bathroom with natural light and the sun streaming in and drying out the towel? 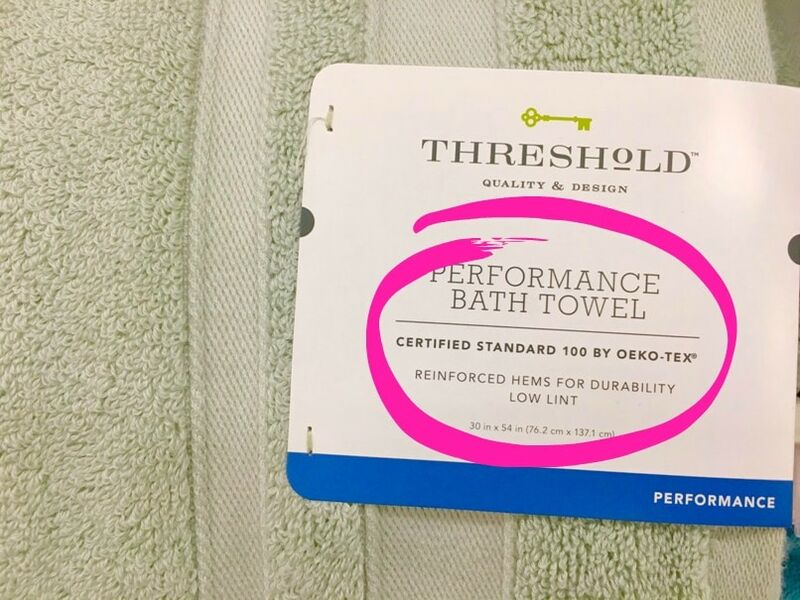 Only you know what conditions your towels are located in. So only you can make that call. Either way, doctors generally recommend changing towels at least once a week, if not sooner. If a member of your family is ill, change the towels daily. It would be wise to give an ill family member their own hand towel that no one else uses if they are sick or you think they might become sick. When towels are bunched up, such as hanging on a small hook or crowded on a normal towel rack, they just can’t dry quickly. Which can lead to bacteria growing. 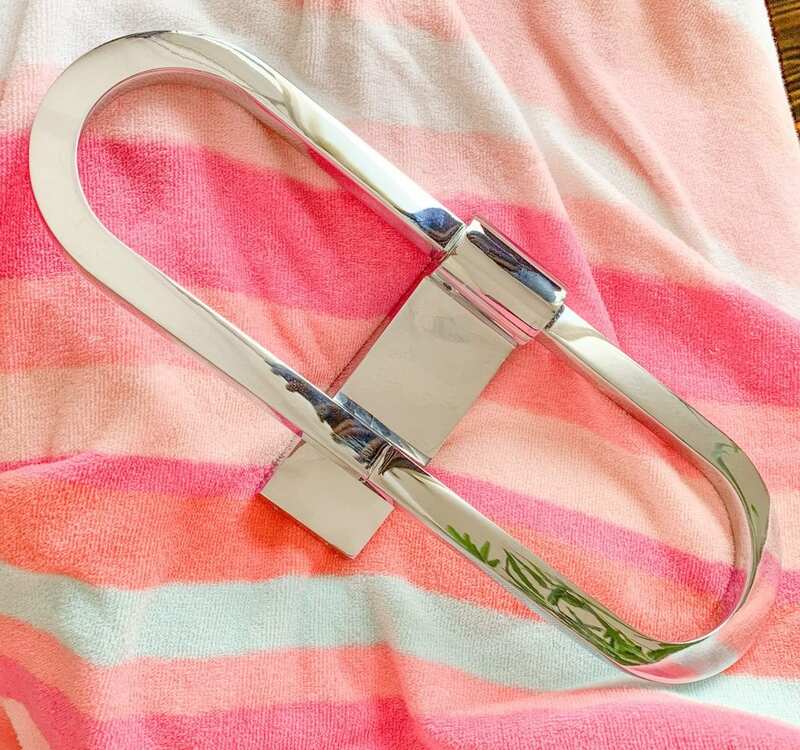 A great idea is to use a towel bar that lets all of the towel be exposed to air and sunlight. 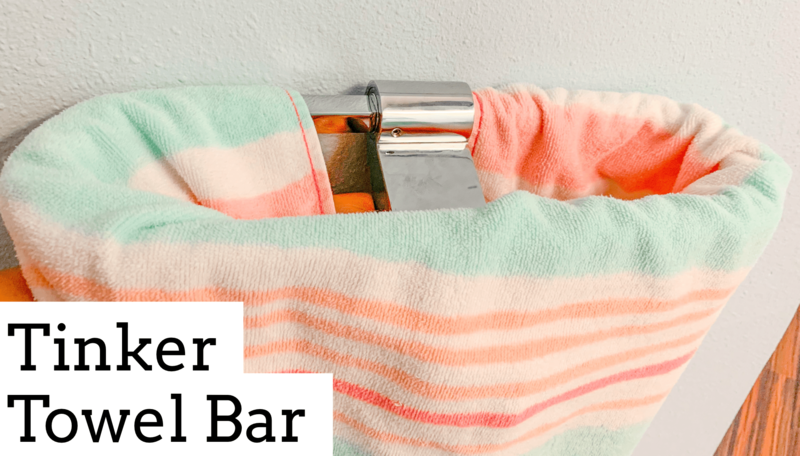 Tinker Towel Bar is a genius oval design that lets the entire towel dry out quickly. By using the innovative design of Tinker Towel Bar, moisture can escape more quickly and more completely from your towels. Which means you don’t have to change them as often. 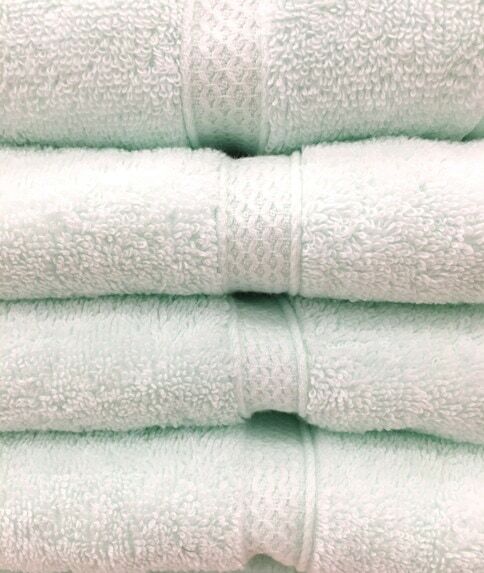 Just like all towels, you NEED to wash hand towels in hot water to kill germs and bacteria. Just how hot the water needs to be is a matter of debate. And there seems to be no foolproof temperature to kill the spread of germs. In this New York Times article, Dr. Alexandra Sowa shares that no temperature has been deemed scientifically perfect. Standard water heaters generally are set to 120 degrees. Yet Dr. Sowa would rather see a higher temperature, such as 140 degrees, to be sure that the germs are being killed. Your washing machine could be the cause of more bacteria on your towels than you might think. If you’re washing machine is germy, then anything washed in the washing machine will get germs, too. It’s super easy to clean your washing machine and prevent this problem. So be sure to dry your hand towels completely in the dryer, where the heat of the dryer can kill germs and bacteria. Or hang towels outside in the sun to dry. This is also a great idea because the sun’s UV rays will disinfect the hand towels, too. Hand towels can add color, décor, and whimsy to a room. But let’s be honest. A hand towel’s first function is to dry your hands and leave them clean. Everything else is just a boost to your style. Hand towels made from highly absorbent materials, such as cotton and bamboo, are the best. Even better are organic materials or OEKO-TEX Certified materials. 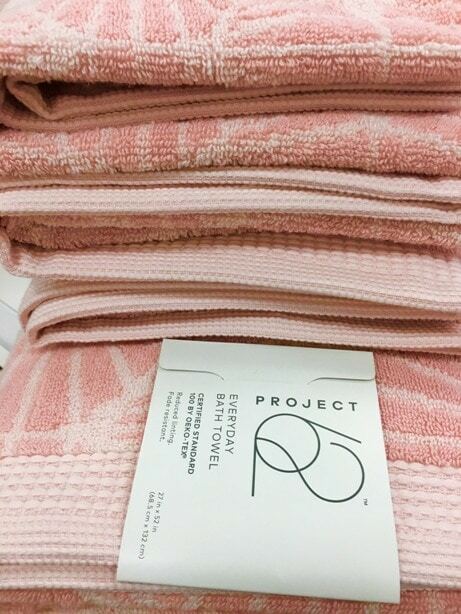 These are some great hand towels from Target that I’d love to add to my house. 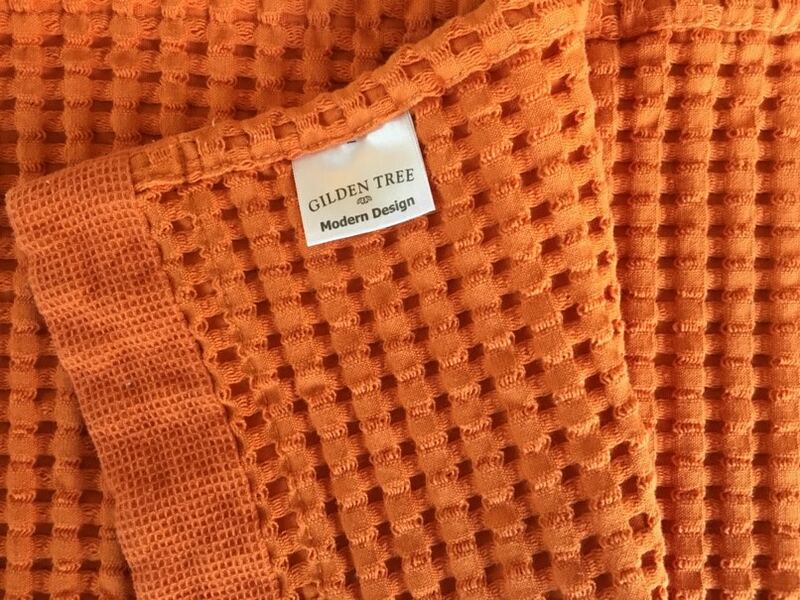 I have a wonderful reader who suggested that I try Gilden Tree Waffle Weave hand towels. 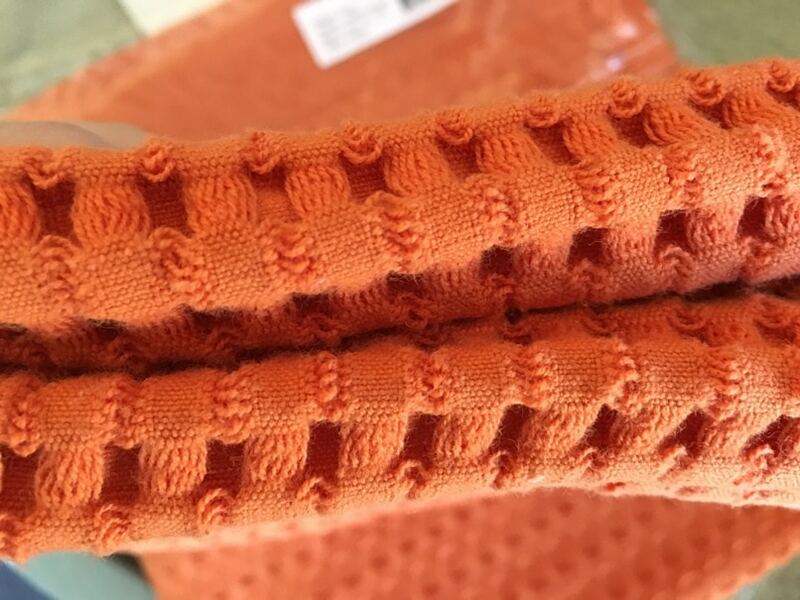 Their waffle weave of 100% natural cotton is super absorbent, OEKO-TEX Certified and eco-friendly. I was sent a sample to try out and love them! I chose the Modern Design in Orange, but don’t worry, there are lots of neutrals and softer colors to choose from for your guest bathroom, too! Whatever hand towels you choose, be sure you buy enough to have fresh ones available between laundry cycles. I absolutely hate drying my hands with microfiber hand towels. They dry out my hands like crazy. They’re also too rough. Every little crack and imperfection on your skin seems to get aggravated while wiping your hands with the rough texture. Hand towels made for style and not function are not beneficial to your health and happiness, either. Those hand towels with cute sayings and graphics are fun to add to your kitchen and bathroom. If they are made with a polyester material that doesn’t absorb moisture, though, then they don’t help dry your hands. Tea towels tend to stay damp for quite a while, too, which isn’t healthy. It’s also supremely frustrating when trying to dry your hands from multiple washings throughout the day. For goodness sake, make it easy for guests to know how to dry their hands in your home. We all are familiar with the decorative hand towels in a guest bathroom. You sit there and wonder, should I use the towel? Is it just for display? And then you end up wiping your hands on your jeans. I have a family member that has a decorative display of towels with rhinestone accents hung nicely in the guest bathroom. There is no other way to wipe your hands dry. Every time I go to the bathroom in their guest bathroom, I’m always wondering how to dry my hands and when was the last time those towels were actually washed? I inevitably try dabbing my hands discreetly on the hand towel hanging up. And then scratch my skin with the stupid rhinestones that are a part of the decorative design on the hand towel. Every time. I absolutely hate washing my hands in that guest bathroom. If you are having a party, consider rolling up washcloths or hand towels in a basket and putting them on the bathroom sink. Or place them somewhere out in the open so that guests know to use them. Also, be sure to add a place to drop the used hand towels, such as a clean basket or decorative trash bin. Go so far as to label the bin so that your guests know what to do. Otherwise, make sure a fresh hand towel is located on a hook or towel rack near the sink. Don’t add it in with your dirty towels and washcloths hanging everywhere. In fact, remove all other towels from the room before you have guests so that there is no confusion as to what towel to use. Love this! 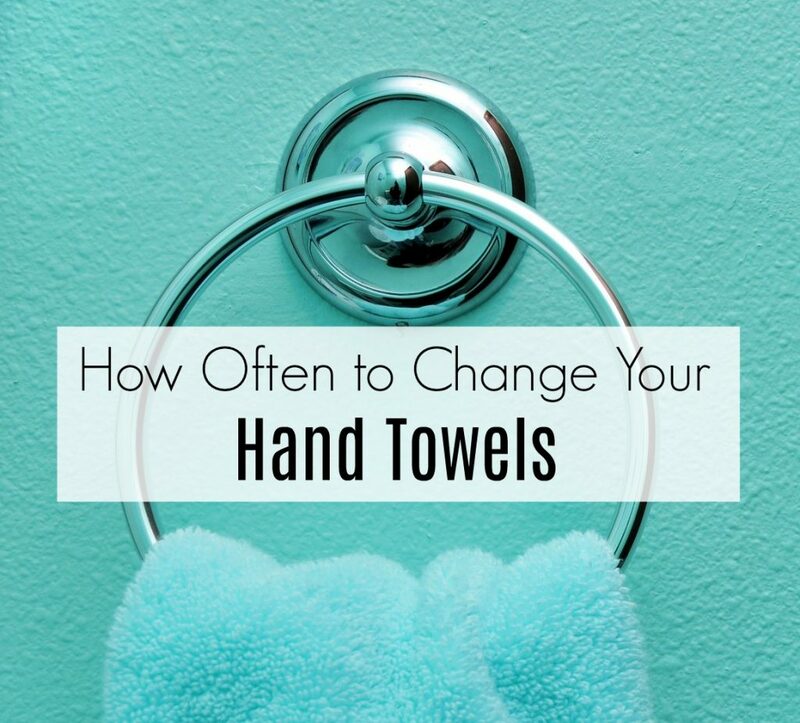 We use hand towels like crazy and I always wondered how often I needed to change them. So far we are doing pretty good, but I think I’m going to check the material of my kitchen ones for sure. Sounds great! I change mine every 3-4 days, but in the kitchen I tend to change a little more.